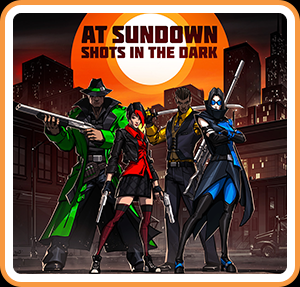 At Sundown: Shots in the Dark is a high-concept multiplayer arena shooter that punches above its weight class. Despite a modest budget and austere assets, it provides hours of enjoyable multiplayer mayhem, both online and offline, and even features some fodder for solo players in the form of bots and tutorial challenges. Its signature shadow-and-light mechanic is something of a double-edged sword, and the grind for new weapons, maps, and modes can turn wearisome, but overall this is a competent shooter that's especially good for parties. A top-down twin-stick shooter, At Sundown distinguishes itself from the crowd via an interesting hook: players can rarely see themselves or their partners and adversaries on screen. Each of the game's 18 maps are cloaked mostly in shadow, which obscures players completely. Only by walking into isolated light sources, running afoul of a trap, or by firing a weapon will players become visible, and thus vulnerable. This stealth twist makes the title uniquely exciting and unpredictable, but also, at times, frustrating and uneven. Essentially, this is a game where, for much of each match, you won't be able to pinpoint your avatar. Developer Mild Beast Games mitigates this issue by allowing players to locate their characters by pressing B (this brings up a small colored icon that's visible to the entire arena) and by sending rumble feedback to anyone who's brushing up against a wall, allowing a primitive sort of echolocation, but in general it's not uncommon to get turned around or disoriented among the shadows of At Sundown's maps. Ironically, this is a game that would probably fare better on Switch's far less successful predecessor WiiU, thanks to its second screen. There are shades here of Luigi's Ghost Mansion, one of the mini-games from Nintendo Land. Still, despite the fact that the title's signature gimmick works against traditional shooting mechanics, the stealth framework can be great fun. One-on-one matches are tense cat-and-mouse affairs, where guesswork, intuition, and speedy reflexes win the day. Four-player matches shed the slow-paced stealth action for faster, kill-or-be-killed gameplay, which is not as nail-biting but is far more raucous, especially for local parties. A variety of modes, weapons, maps, and power-ups increase that raucousness. Players can select from stages based on gardens, mansions, factories, subways, and discos—each with special hazards and light sources—and equip themselves with standard weapons like SMGs, shotguns, and sniper rifles, or unusual projectiles like rivetrifle, shockbow, and umbrella. That's right: if you want to channel your inner John Steed or Oswald Cobblebot, you're in luck. Some weapons are more powerful and useful than others, particularly in four-player brawls, but the game always allows weapon swaps after each death—unless, of course, "full commitment" is activated in settings. Game modes include classics like deathmatch, capture the flag, and king of the hill, and a neat option called "back to basics," reminiscent of Halo's Team SWAT, where players cannot run or dodge, and must use the shotgun. Not every stage, weapon, and mode is unlocked at the beginning of the game however. While some early unlocks are quick and easy—it won't take many matches or experience points to obtain the sniper, sword, or subway—later items come with intimidatingly-high XP thresholds. Luckily, solo players can work toward the unlocking process even without friends, thanks to support for bots and a bevy of tutorial stages, each offering three medal tiers. Level design and enemy AI is good enough, in fact, to warrant a fleshed out offline campaign. As of now, though, the game is almost exclusively a multiplayer affair. At Sundown sports some rather spartan graphics, but that doesn't detract from the experience. It's far more important to allow players to quickly identify barriers, hazards, and other players than it is to produce detailed environments and rich textures in a busy shooter like this one, after all. The game embraces utilitarianism in its production design, for the better. Music and sound effects are mostly forgettable, with the big exception of the Quake-ish announcer who calls each match with plenty of gaudy "double kill" and "unstoppable" pronouncements. At Sundown is a fun shooter, particularly for four players in local multiplayer. The game's stealth mechanics can be counter-productive and disorienting, and unlocks can arrive too sluggishly, but a wide range of maps, modes, weapons, and offline and online options keep the production afloat. It would be a satisfactory addition to your next game night. This review is based on a digital copy of At Sundown: Shots in the Dark for the NS, provided by the publisher.